It is in this case in the history of the railway Cortes Borja , just over seventeen kilometers long and meter gauge. 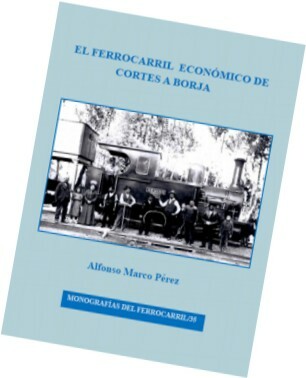 Alfonso Marco, Railway historian and collaborator of Vía Libre and other journals of the railway branch, returns to this railway faced in a first publication several years ago, now expanding content. Despite its short length and not very long life, 66 years, the train managed to bring progress to the people connecting from the distant date of 1889. That progress championed what this railroad and others who came close much later as Sádaba -Gallur until the early 30s of last century, at which time begins to change transportation to opt to the road began to be favored under the Special Law Firm, implementation at the end of the previous decade by the government of Primo de Rivera. As the author of the book says very aptly nicknamed worked as Borjica was useful. Specifically it was finally closed on 7 April 1955. Curiously, it is the same year as the foundation for high-speed rail are made after the tests in France with two electric locomotives achieving 331 km/h in tests. He had already used almost an hour to go just over seventeen kilometers of the line sense. Being the shortest of the Aragonese meter-gauge lines may assume that his story can be told also briefly. However it is a great success of the author's analyze this line via also close from a perfectly basted humanist side setting in the collective memory of a people passion in Aragon travel beyond their horizon. rolling stock. The story is not only entertaining, which the same author already has us accustomed in their multiple articles, but is also interesting for those fixed on the technical side of the railroad with descriptions engine equipment and mobile and attempts to cope with increasing competition from the road with dual carriageways. Particularly curious is the story of tractocarril. Not only technical explanations relating to rail factory but the development of populations and the environment as Gallur Alagón together with Cortes, one of the heads of the railway, by the famous jugoducto.Se also details attempts to bring out the dying line increasing gauge, as the next railway Tudela-Tarazona and even a possible electrification. Size: 22 X 20 X 1,8 cm.